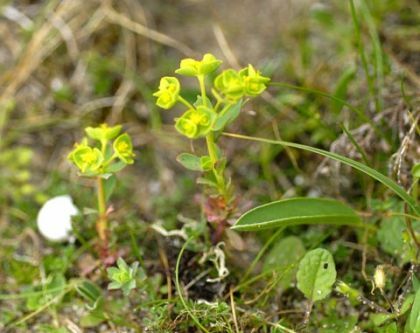 This is a short little perennial which is found on sandy sea-shores and cliffs. Its little flowers are, like others of this family, without petals or sepals, having yellowish-green bracts and long horned glands. The leathery, oval leaves are hairless with a prominent midrib below. 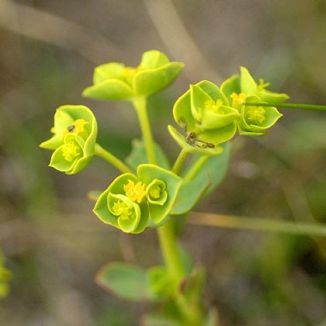 It flowers from April to September in coastal areas, is a native plant and belongs to the family Euphorbiaceae. Roy Watson of the Wexford Naturalists Field Club kindly introduced me to this plant at Ballyteigue, Co Wexford in 2008 and I photographed it there at that time. This is a very large plant family with over 1,500 species worldwide. Among them is the Christmas potted plant – Poinsettia. Like all other Spurges, the sap or latex in this plant is poisonous.